As I sit here on a plush mauve couch in a stranger’s warm, well-lit living room drinking fair trade organic French Press coffee with soymilk and stevia, typing away on my computer, I feel really, really grateful, lucky and blessed. 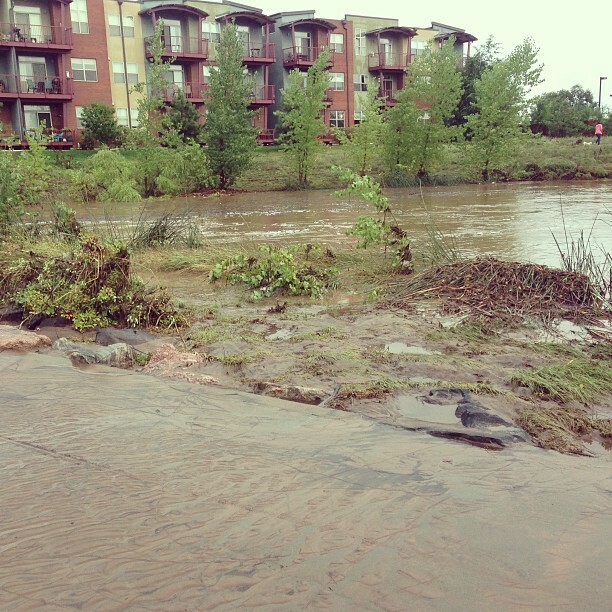 If you’ve been checking the news lately, you have probably heard that Boulder and other parts of Colorado were recently hit damn hard by a historic flood. I moved to Boulder a few weeks ago. I wrote a post about it. Courtney and I had just moved into our new apartment four days before the floods hit. At about 2:30am on Thursday, I awoke to Courtney telling me water was coming up through the floor (we chose a first-floor apartment–oops!) and that we needed to take action. The flood definitely came by surprise. We have a really sweet landlord who coached us through the necessary steps to leaving the place–putting as much of our stuff as we could up on shelves and on top of the fridge and kitchen cabinets, turning off the power fuse box to avoid electrical issues, putting down towels wherever we could. Twitter confirmed roads were closed and there wasn’t a possibility to go anywhere outside of our building during the storm, so we brought our sleeping bags and blankets to the third floor of our unit and texted with friends in the area to see if they were out of harm’s way, and prayed for those were were vulnerable to the storm. 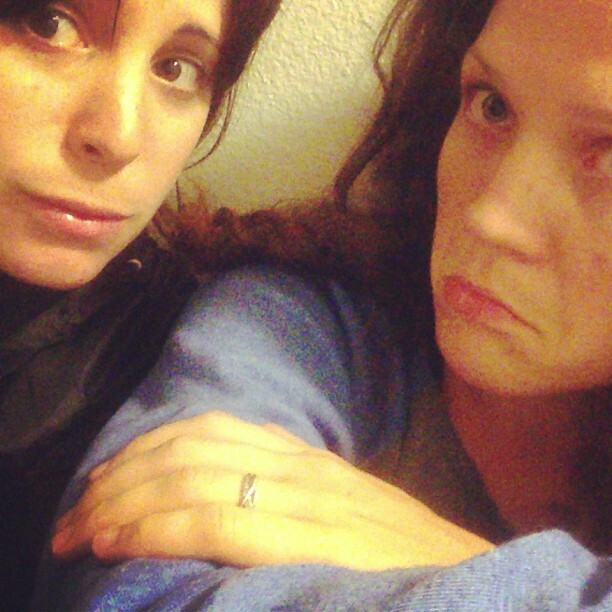 We snapped a selfie to commemorate the crazy evening (look–we’re the Instagram generation!) and then tried to get some sleep in the hallway. After some half-sleep, we were rescued by our landlord’s friend, a nurse who showed up in his shining black Subaru while there was a bit of a break in the rain. He took us to a nice home a few blocks away owned by a mutual friend of theirs, which also became home to other flood refugees. I am grateful for their kindness and generosity. I checked the news and contacted friends and started getting a sense of the true devastation of the flood. Towns and homes destroyed. Our apartment was wrecked by the flood water, but thankfully we were able to grab our laptops, passports, a change of clothes and some rations. Nothing was destroyed that can’t be replaced. I have to give a big shout-out to Tasty Bite, who miraculously sent me samples of their products to review right before the storm hit. I grabbed some of the yellow bags quickly on my way out, and have been so glad I did! 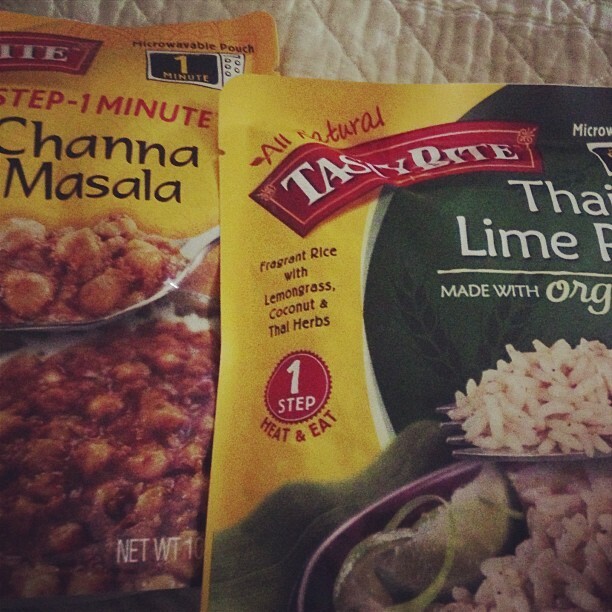 Lots of delicious, easy-to-prepare quick meals have really helped out in a pinch. Tasty Bite will be my new go-to camping or emergency food supply, for sure. It tastes great and doesn’t even require cooking, though I have heated it up and served it with fresh greens. Tasty Bite is the best flood food ever. The past few days have meant rebuilding in many senses. Courtney and I have since gone over to our apartment and pulled out soaked drywall, cabinets, and baseboards. Our landlord brought a crew of folks to get started on the construction, and has been amazing in every sense, working quickly to help us get back into our apartment–cross your fingers it’ll hopefully be next week. Boulder and nearby towns are wrecked–roads destroyed, paths muddied, homes ruined–but there is a sense of resiliency as volunteer crews have already formed to help people and animals cope with the storm’s wake. It’s been humbling to think of how many have been hurt by this storm. Boulder Pride was slated to happen today, and I agree with the organizer’s decision to postpone it. Now is not the time to party; it’s the time to restore, help out, and rebuild. As I work remotely, I’ve been able to get some work done amidst this flood chaos, and have been touched by the kindness of the clients with whom I work who have witnessed this from afar. 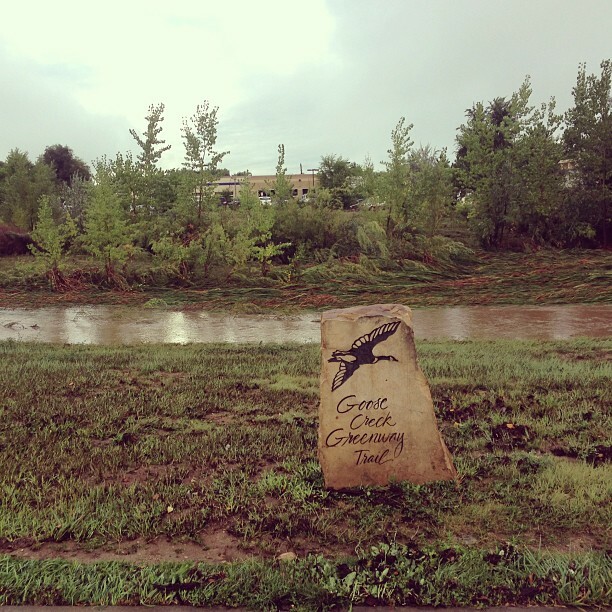 The muddy Goose Creek path in Boulder, CO. The Goose Creek Greenway trail filled with mud after the flood. 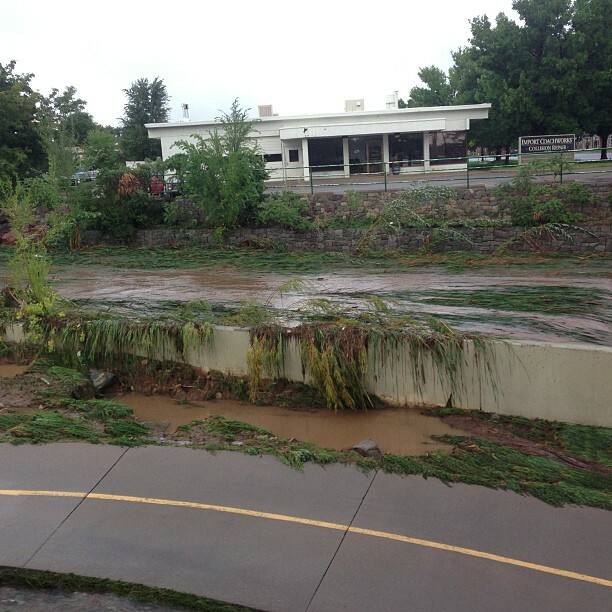 The Boulder waterways are muddy and in need of repair after the flood. 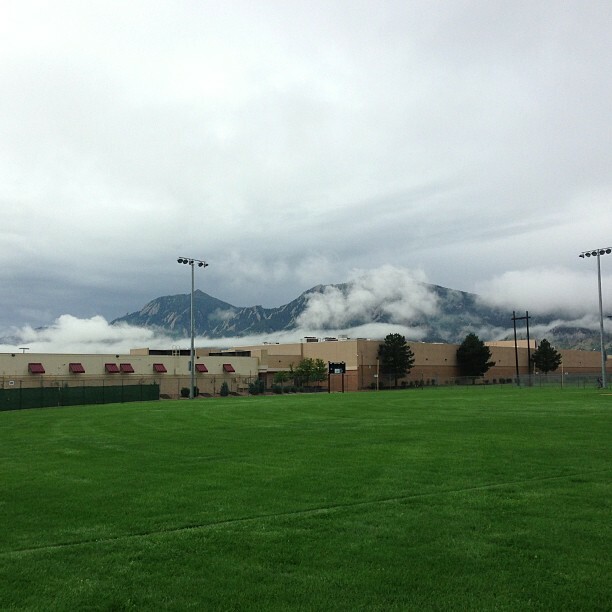 The iconic flatirons enshrouded in clouds the morning after the flood. A lot of places in Boulder have opened up again, including gyms, Whole Foods, and other local businesses. Life goes on. There is a lot of work to be done to repair what the flood has done to this city and its people, but it’s heartening to see some things springing back to life. I have been blessed and lucky to be safe and to have been helped out by some truly kind and lovely folks, as well as to have such amazing friends and family who have checked on us and offered love and support from a distance. Thank you, sincerely–it means the world to me.